"I have searched for years for one of these and finally found one! Normally only find a small one in very few newspapers! Wish for more of them ★ ★ ★ ★ ★ "
Welcome to this fantastic collection of Number Cross puzzles! Similar to cross word puzzles, these are perfect for all puzzle fans and a great twist on the famous classic! Each of the numbers only has one position in the finished puzzle. Can you work out where they should go? 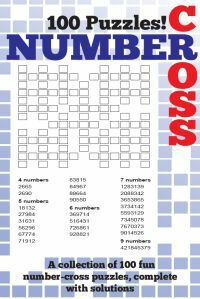 Try and place the number that has the least possible places first to help solve the puzzle. 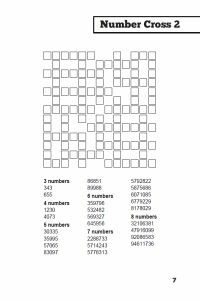 If you are new to these puzzles, then being presented with a blank grid and a list of numbers and being expected to solve the puzzle can be a bit daunting, but actually these a fun challenge with very simple solving methods available! At the start of the puzzle, the usual way to make progress is to look at the length of each of the numbers: for instance 3 digit numbers, 4 digit numbers and so forth - and then to look at the ones with the least options. For instance if there are 2 9-digit numbers but at least 4 of each other length of number, then you should start with the 9-digit numbers, and see if any can be placed. The best thing to do is to say: "if we place this 9-digit number here, then will it stop any other crossing number from being placed?". If the answer is YES, then you know that this number doesn't go here. Where there are only two options, you can now place both straightaway: place this number that you just said YES to at the OTHER 9-digit location, and place the second of the 9-digit numbers at this location. If there are more than two options available, then discount this one and work down the list, noting for each one if it can be placed or not. In instances where there is only one that can be placed here, then place it. Sometimes you will whittle down the options to something manageable like two. Here you have two options: you can look elsewhere in the grid and repeat the process, or if you fancy a tougher challenge you can try to mentally keep track of both options and see how quickly you come to a contradiction. Sometimes you will note that each option has the same number at a crossover, no matter which option you pick: for instance if both 9-letter digits have a '3' as the fifth digit, then that can be written in. Now if that is a crossover digit in the grid, then this can often be used to place other numbers elsewhere, or at least reduce the options: so sometimes you don't even need to know which number to place to make progress! Every puzzle here has one solution, and you can use logical rules to find it, you don't need blind guessing, just some 'if this then that then... that's a contradiction' sort of logic, good luck!